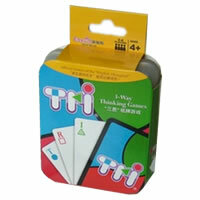 Tri, the card game, gets its name from the fact that it is a three-way thinking game. Players will utilize shapes, colors and patterns to make "twins, brothers and trios." Four different games are listed in the game rules: touch, match, catch and hatch. 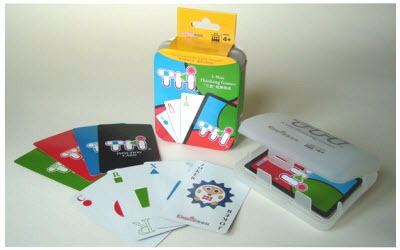 If you're looking for an entertaining game that has a couple different options of game play then Tri is a great game to have. Good for up to four people, Tri only takes about 10 minutes to complete. Learn more about this card game and tell us what you think below. 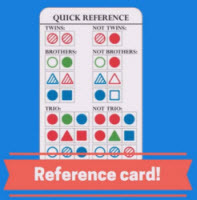 Review Completed (2017-08-08) Tri is an interesting card game that utilizes shapes, patterns and colors to form "twins" (three same features making an identical card), "brothers" (two same features) and "trios" (three cards that form a pattern). A quick reference card is included to help explain what is allowed for each match and what is not. While it is helpful we found ourselves questioning matches that were not listed in either category. We tried to apply two commonalties between three cards for a trio (they must have two similarities in either color, shape or pattern). We hope this was the right way to play. Touch - a "beginners" guide to learning Tri. Players try to identify trios by laying down cards next to each other in the center. Once a trio is identified everyone must race to place their hand on the last card to make the link. We found ourselves at times not even paying attention as we were only concerned to not be the last hand down. Match - this is a twist on your standard memory matching game. What we found odd was the memory game was only a phase to get you cards so that you could spell the largest word in the next phase. Since there is only two full alphabets worth of letters available, your word choice is fairly limited although we did come up with some "larger" words. Catch - this is a similar spin on the card game Uno as players lay down one card at a time forming brothers. Function cards are draw-three cards and jokers are reverse and draw-three cards. From there the rules get more complicated and overwhelming on the other possible plays. Again, this is only the first phase where players then move on to a spelling phase where the rules get even more scrambled as to how to score points or redeem yourself. Hatch - to be honest, by this point we were all lost and utterly confused. Refer to the game rules to learn how to play Hatch. We tried really hard to understand the game rules and reread them multiple times. We even watched a few videos on how to play which helped greatly. We felt like the two phases cluttered the game and almost made the first phase pointless since so much was determined on what you could spell. This game has a lot of potential and possibilities and will most certainly appeal to some people. It was fun once we decided on how we thought it should be played and omitted the spelling phase all together. On a positive note, we were impressed by the packaging and storage case that Tri comes with. We’ll try to let our brains have a rest and give this game another try. See the game rules for specific game rules (different games can be played with different endings). You get 54 cards and the official Tri game rules and instructions. Please keep in mind that the official Tri dice-card rules and instructions could be different depending on the game version you have. The rules below are some of the exact directions on how to play Tri. Share with us your comments, funny stories, tips, advice, strategies, creative ways to play, questions about how to play, problems with the rules or anything you want about Tri. All submissions will be reviewed within 24 hours. Click here to add your Tri comments.